A 5-inch tablet might seem rather odd in this day and age, but Panasonic has just announced two of them. 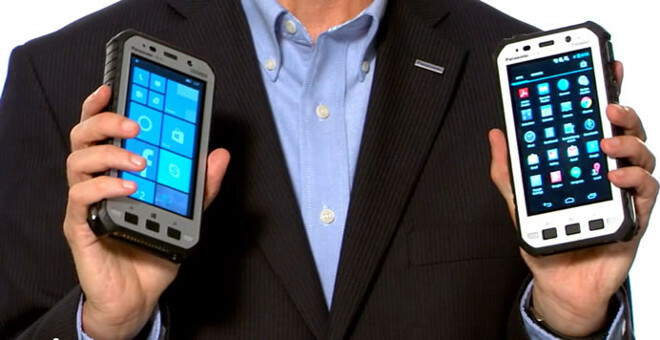 One runs Android, the other is powered by Windows 8.1 Embedded Handheld, and they’re both extremely expensive. On the other hand, they’re also both incredibly rugged, being able to withstand drops onto concrete from up to ten feet. In fact, they go beyond even the military standard MIL-STD-810G in terms of how resistant they are to the elements or accidents. The Panasonic Toughpad FZ-E1 is the Windows device, and the Panasonic Toughpad FZ-X1 runs Android 4.2.2 Jelly Bean. The former will be available in August in Wi-Fi-only form, and will retail for $1,899. A model with telephony built-in and mobile broadband support will arrive in October for $1,999. The Android-powered X1 will be out in August for $1,799 (Wi-Fi-only) or $1,849 (with mobile broadband and telephony features). Both of these tablets are fully dustproof and can be submerged in up to five feet of water for up to 30 minutes, being IP68 certified. They can operate normally in temperatures between -4 and 140 degrees Fahrenheit, because they have a built-in heater. They’ve been tested for resistance to vibration, altitude, and extreme humidity as well. Panasonic touts 14-hour battery life with continuous use, as well as their ability to charge from empty to 50% within one hour. The new Toughpads boast FIPS 140-2 Level 1 security credentials, as well as sunlight-readable HD touchscreens that can be operated with gloves. All of their traits obviously make them especially interesting for use by various professionals such as first responders, military personnel, and people working in the field.